Shopping around to save spending cash for any Lexmark toner? If your Lexmark printer is running out of toner you can receive significant savings as a result of obtaining all your replacement Lexmark C750 toner cartridges from us. Cartridge Save has a low cost commitment so that you only get very good offers on Lexmark C750 toner so you don't need to go and shop with expensive PC hardware shops Our company aim to meet the needs of each and every buyer by giving fantastic prices along with high quality Lexmark C750 toners cartridges which will function properly every time you print. Save Money Now For All Lexmark C750 Toner Cartridges! We'll offer you speedy and free delivery on Lexmark toner. Spend less when you purchase cheap Lexmark C750 toner by using Cartridge Save's online shop. However, you are able to get your hands on this discount priced Lexmark C750 toner cartridge simply by telephoning the orders line. Just remember, Lexmark C750 laser toners supplied by Cartridge Save are guarded with a cast iron money back guarantee that will give you time to claim a 100% refund so customer support is never difficult to get in touch with. We're offering speedy delivery, solidly built laser toners along with the lowest possible prices. It makes sense for you to opt for us for your C750 toner. For the small but busy small office that needs to be creative with output, the Lexmark C750 printer is a suitable choice because of its colour print capabilities and support for a wide selection of media types. The Lexmark C750 colour laser printer has good expandability options, too, but the high cost-per-page ratio and the absence of built-in networking features make it less efficient. 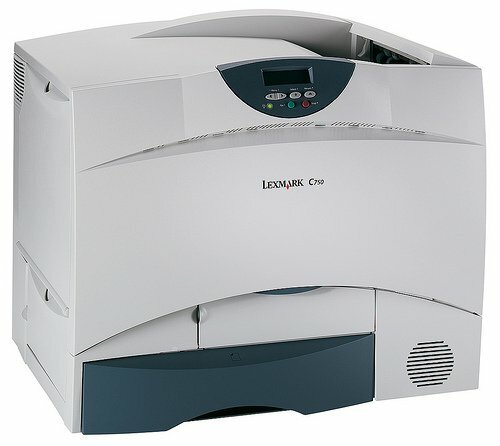 Unlike its predecessors, the Lexmark C-750 has a wider footprint measuring 23.8 inches wide, 20.8 inches tall, and 18.5 inches deep, and it is also heavier, weighing 47.62Kg. The C750 printer has a standard 500-sheet capacity plus a 100-sheet multipurpose feeder, while the output bin can handle up to 250 sheets. The default resolution is 1200x1200dpi. There is a small control panel with one-touch operational buttons a mini display screen, and the standard ports are bidirectional parallel, USB Type B, and an internal card slot. It supports PCL 6 and PostScript 3 printer languages, plus a good selection of fonts and symbol sets. The memory of the Lexmark C750 laser printer is expandable to 512MB. The low noise emission won't disrupt the quiet office. The print resolution of the Lexmark C750 colour printer can be adjusted to 2400dpi image quality so pictures and graphics look more accurate. The print speed is up to 20ppm. For cheaper output costs, this model can use high capacity Lexmark C750 colour cartridges which can print up to 15,000 pages per toner. Many of the good features that can improve the performance of the C750 colour laser printer are optional, including the duplex unit, the 3,000-sheet finisher, and the five-pin mailbox. Ethernet and the Coax/Twinax adapter for SCS are also optional in the Lexmark C750.